Suzanne Reviews ‘Won’t Back Down’!!! Educational reform is a difficult enough subject for policymakers to tackle. Nothing is black and white, no one is completely to blame or completely self-interested, and there are a tremendous number of problems and an infinite number of solutions. So in approaching a movie about the plight of public education today, it would be nice to see the subject treated with the nuance appropriate to actually reform the system. Unfortunately, Won’t Back Down misses this nuance and focuses on creating a good vs. evil environment with two sides that don’t work together to find a solution. Fine, it’s a movie – except this is a subject that requires some thought, and so should this movie. Jamie Fitzpatrick (Maggie Gyllenhaal), a single mother working two jobs, is trying to do better for her dyslexic daughter than was done for her. When she sees that her daughter is not getting the attention she needs in her struggling inner city school, Adams Elementary, and after other options have failed, she decides to take on the bureaucracy of the school district and have a parent/teacher take over of the school. 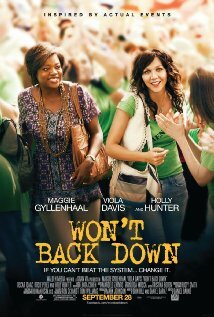 In looking for a teacher to help her start the movement, she reaches out to Nona Alberts (Viola Davis). Nona has issues of her own. A burned out teacher, a mother of a son who is also struggling in school, and dealing with a failing marriage, Nona at first would rather see the world continue on the way it is because it is easy to deal with it that way. But as bullish Jamie keeps prodding Nona and telling her she believes in her ability to lead a new school, Nona takes on the challenge and together they convince parents and other teachers that they can take over the school and make it a success. They still face difficulties. Jamie begins a romance with one of the school’s stand out teachers (Oscar Isaac), but has a hard time convincing him to go against the teachers union. Nona is at first ostracized by those she has taught with for years because they fear the loss of their union benefits. Jamie is trying to fit in monumental school reform while keeping her day jobs and dealing with her daughter’s issues. The school board bureaucracy continues to make the process as difficult as possible and discourages the application for a school take over at every step. The teacher’s union spreads lies and negative information in order to derail the threat to their power. Frankly, in a take over situation, these interest groups would all have a stake in the situation, and they would assert their positions, but the portrayal in this movie is that the bureaucracy moves slow because it doesn’t want change at all and all of the school board members are completely burned out, disillusioned cogs that never actually think of the students anymore. The teachers union (featuring a small performance by Holly Hunter) only cares about the continuation of the union and teacher pay and not about actual education or students. Here, no one cares but a handful of teachers and parents and they are all that is good and right and that is just how it is. I think we all know that this oversimplification is not true, and this movie does more of a disservice to educational reform movements by showing two sides that can’t come together to discuss and opts to present these ideas in absolutes. I know that everyone who took part in this movie wanted to start a conversation, but to me that conversation seems to be bureaucracies, unions and even most teachers don’t actually care, and we should completely fight against them. This doesn’t open a dialogue – it preaches on like a demagogue. In the end the school is taken over, Nona is the principal, Jamie’s daughter is reading in front of the entire school, and now, tritely, the movie ends with her stumbling to say one word – “Hope”. For me, this sentiment had not been inspired throughout the movie and so it fell flat. Viola Davis did give a great performance and the connection she shares with her son, Cody (Dante Brown), is genuine and provides actual poignant moments. Emily Alyn Lind also does a great job as Jamie’s daughter, Malia. Child actors don’t always hit the mark, but these two did. Unfortunately, the story did not do their performances justice. Maggie Gyllenhaal seems to be reaching to make every scene important and inspired, but by the end I was kind of tired for her. It just didn’t work. I cannot recommend this as a movie to go out and see in the theater. It is not Stand and Deliver; it’s not even close. If you are truly interested, wait for DVD, but maybe have Waiting for Superman ready to really get down to the issues of today’s education problems. Film Review: The Big Sick! This entry was posted on Friday, September 28th, 2012 at 4:16 pm	and is filed under Film, News. You can follow any responses to this entry through the RSS 2.0 feed. You can skip to the end and leave a response. Pinging is currently not allowed. Did you know if you mixed equal parts of gasoline and frozen orange juice concentrate you can make napalm? No. I did not know that. Is that true?